Leave the red wire from the TCC solenoid to the case connector. 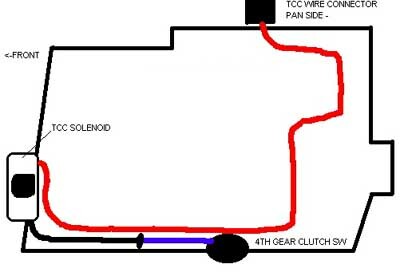 Splice the black ground wire from the TCC solenoid to the (usually) blue wire running from the 4th gear clutch switch. Cut off and remove any additional internal wiring. Not all 4th gear switches will work with this wiring setup. It will only work if you have a Normally Open (N/O) switch. You can check this with a meter. If it shows zero resistance when you measure across the contacts, it's the wrong kind. To correct this, get a switch from a GM dealer, part number 8627332. You can order it from GM Parts Direct, too.